chomp had the most liked content! No, not adriel. Different type of social scientist! 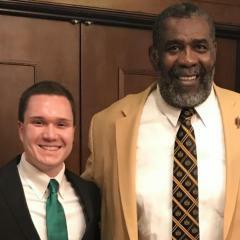 It thrills me to no end that UNT is doing more and more of these sort of things because these are exactly the traditions that help to build a lifelong connection between alumni and the university. When I first arrived at UNT, students often tended to see it as stopping off point for a few years that created little long-term connection. That has really changed over the last several years and things like this reinforce it. The advice that I give my students (liberal arts majors), is to focus on developing skills while they are in college rather than just think very narrowly about a particularly job for a specific major (ie; political science=law school, biology=med school, etc.). While most liberal arts degrees don't train students for a specific job, they can prepare students for good jobs - if students focusing on developing marketable skills. A liberal arts student that takes advantage of the opportunities that their courses give them to develop the ability to write well, communicate ideas, and analyze data can do quite well, particularly if that student has also developed some skills along the way in something like statistics, database management, a computer language, etc. Is the big flag pole up? I was walking over there this afternoon and saw a pole that I had not noticed before. Hopefully, this is it. Otherwise, I am incredibly unobservant. Access to Apogee on Non-Game Days? Does anyone know if Apogee Stadium is open to the public during the week? To get some exercise, I've carved out a good 4 mile walk through campus and across the pedestrian bridge over to Apogee Stadium. Now that I'm in a bit better shape, it occurred to me that adding some stadium steps might be something else I could do if it is allowed in Apogee. Thanks! Thanks, everyone. I appreciate it. This is really helpful. My wife and I are bringing her parents to the game on Saturday and we are wondering how crowded the ADA lot near Apogee tends to be. Her father is disabled and has a handicapped placard, but we are trying to decide how quickly the ADA lot nearest Apogee tends to fill up. Thanks for any advice. This was the first game that I have made it to this season and I have to say, I was really impressed with the student section at last night's game. It was the most involved that I have seen them in a game in a long time. Once we moved from our initial dead stadium section to the student side, it was a lot more fun. Heck, my wife actually wants to go to another game, which is a minor miracle. One minor point that I don't understand, since UNT really wants to draw newcomers to games, why doesn't the display board show the words to the alma mater/fight song when it is being sung? For newbies, you feel kind of like an idiot just standing there, wanting to support the team, but having no idea what the words being sung are. One of the biggest traditions at my alma mater is singing our fight song at the end of the 3rd quarter while the crowd sways. Even though that is an old tradition, the words still are displayed for people to follow along. It seems like a trivial thing, but anything to get people more involved would seem useful. 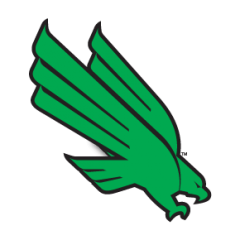 UNT faculty and staff just received an email outlining a free ticket promotion for faculty & staff for the Marshall game. It sounds like the aim is for this to be an annual event. Not only is it great to see this kind of outreach by the new AD, but it is good to see some new thinking about ways that UNT can get more people interested in UNT football. Here is the blurb from the email: Staff Senate and Athletics are partnering to debut the Staff and Faculty Appreciation tradition, which will provide each UNT faculty and staff member with two free tickets. Employees can purchase additional tickets for only $5. The game will also feature tailgating and a friendly competition between UNT divisions. As someone who has attended his fair share of both Mean Green and Gator games, I was going to restrain myself from chiming in, but here goes: the entire Del Rio incident was an example of how unfortunate things can sometimes happen even when people are just doing their jobs. Wheeler was just doing his job trying to get to Del Rio. Between getting around the Gator OL and trying to get the sack, I can't possibly see how Wheeler could have possibly had the time or physical ability to plan out making a specific hit to injure Del Rio. McElwain was also doing his job, he is in his second year, has a new, unproven QB, and needs to get both the team and the Gator fanbase to buy in to him. Raising a ruckus after the Del Rio injury seemed like exactly the thing to do to show a young Gator team that their coach has their back. This is all the more important for a time that has to travel to Tennessee next week and will do so with an even less proven QB. Littrell has the same job as McElwain, show his team and Mean Green fans that he will fight for them and get them ready for bigger battles down the road. Standing up to McElwain was exactly the way to do that. No need for anyone to hate anyone here. That is why Georgia fans exist, for everyone to hate. UNT has more wins over Florida than Tennessee has managed to achieve in the last 11 years and Kentucky has managed to pull off in the last 30! For those heading to Gainesville this weekend, have a great time! I wouldn't give UF too much credit, Muschamp got two contract extensions despite only one decent season during his tenure. UF is now on the hook for three years of his salary plus that of the assistant coaches. A lot of credit for this goes to the academic support folks in the athletic department. Compared to how things were when I first arrived at UNT, they have really stepped up monitoring of student athlete performance in the classroom over the course of the semester. I now get a request for information on the status of athletes in my classes every couple of weeks from the athletic department. Petrino is a heck of a coach, but he has no business working in a job as a leader of young men with the kind of character issues that he brings. Between his dumb mistake at Arkansas, lying to his AD about it, and the gutless way that he left the Falcons, he is really a sleazeball. Say what you will about Dodge and McCarney, at least they are men with decent character. What are the odds that UNT will cancel classes that day (or evening classes that night)?